Well, I did it. 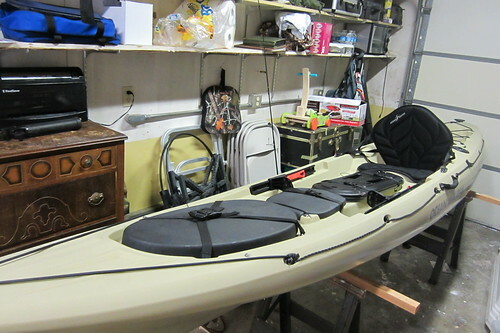 After a wonderful season of fishing with my $200 beginner kayak, I bit the bullet and purchased a dedicated fishing kayak. And not just any fishing kayak. I got one of the best. 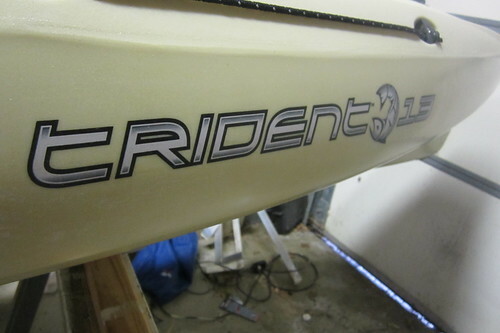 An Ocean Kayak Trident 13. I wanted red, but did not want to wait for one to be ordered. My options where this color or camouflage. I chose this sand color for absolutely no reason. The Trident 13 is very popular in my area. A lot of the local legends use it. After sitting in it in the store I could see why. It is close to perfect. I should stop here and say that I purchased my kayak at the Appomattox River Company on Mercury Blvd. in Hampton, VA. I am lucky to have a dedicated kayak shop 20 min from my house. If you are in the area and would like to see a full shop of kayaks, I recommend you stop by. They have great service! The Trident 13 has an impressive set of features. 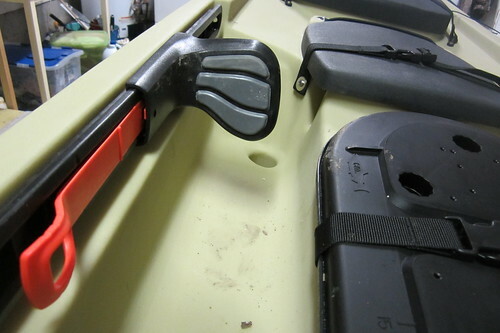 My previous kayak was not made for fishing. I did not realize what I was missing out on until I sat in this one. To make things simple, I'm just going to run through the basic features of this kayak, and tell you how I plan to use them. 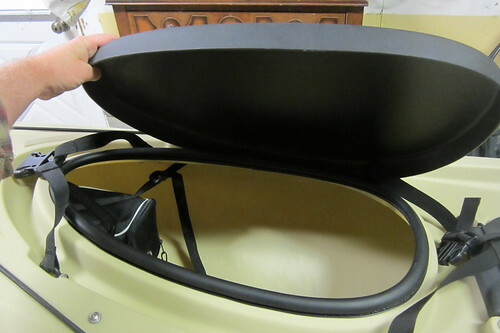 The front hatch is spacious and has a battery bag hanging from it. I have purchased a fish kill bag and plan on keeping it in here. That will be an entire other post later. This small covered area is for a fish-finder. The cover acts as a sun screen when the fish-finder is being used and closes down to protect it during transport. I really like using a fish-finder, so I will install one first thing. 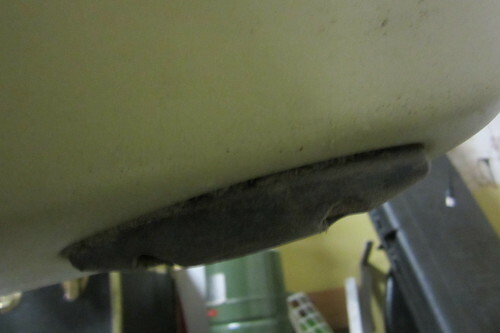 It also has a divot molded into the hull for a transducer. This requires a mount which I will buy or make. Probably make. ....is cavernous storage. I have lots of ideas for this. I'm hoping to eliminate my crate in the back by creating tackle storage in here. Stay tuned as I experiment with this. The seat is fairly standard. I've heard bad things about it, but anything is better than the one in my old kayak (no seat). 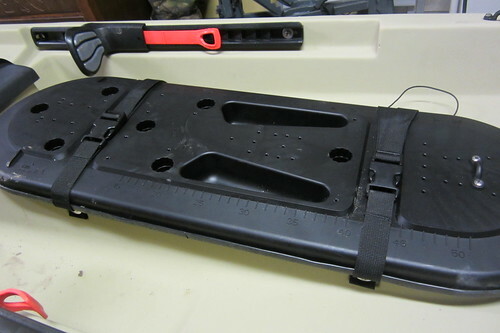 It does fold down for storage, but uses plastic clips. These will be upgraded to metal clips soon. 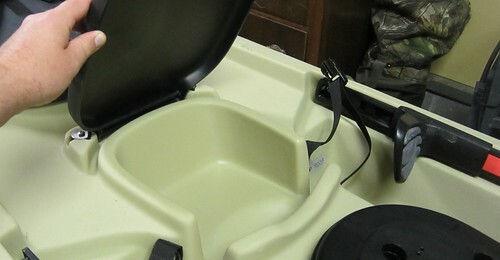 The rear well is big enough for a cooler. I'm not sure what I will put there, but I am thinking of a bait tank. 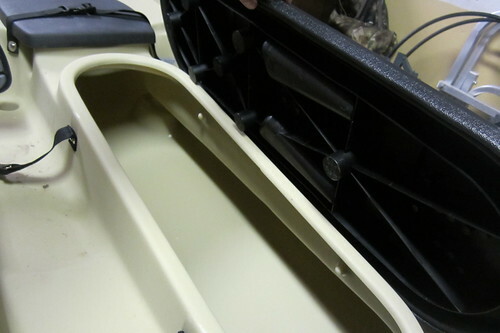 Notice the built in rear rod holders. 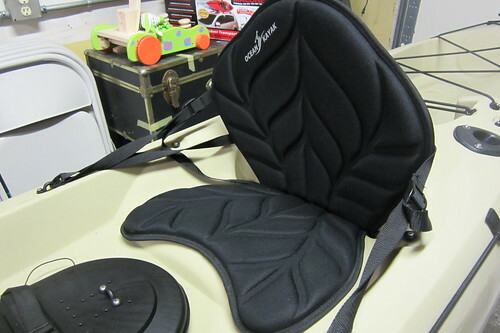 Each side has a simple paddle holder. This design is new to me, so we will see how much it is used. 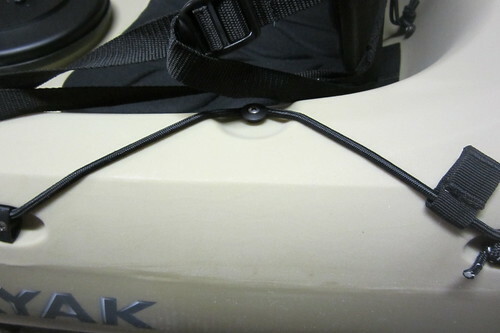 Each side also has an accessory rope. I guess this could be used for tying things down on deck or for hanging a stringer. I can't find anything on this boat riveted down. Everything is screwed down, a much more secure method. Also, the hatches do not screw or have hinges. 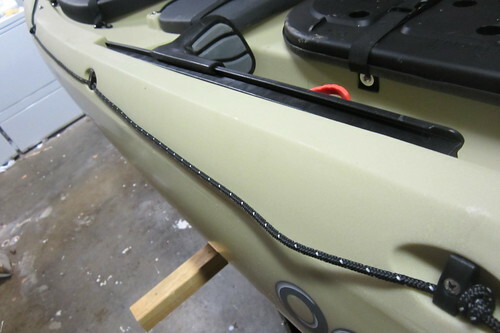 They strap down, another simple, but more secure method. 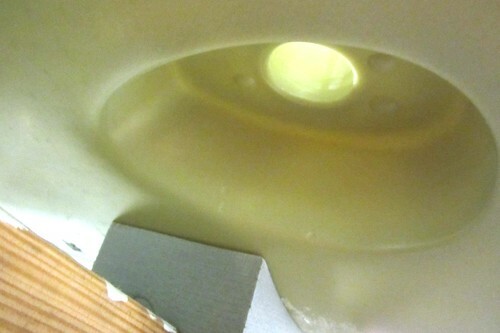 There are very few moving parts to break or leak. As a testament to how long this boat should last, the stern keel (maybe, I'm not up on my ship parts) has a replaceable section. The only thing that I know I will need to add to this Trident 13 is an anchor trolley. I don't know why anchor trolleys are not standard on fishing kayaks. They are a necessary safety item. 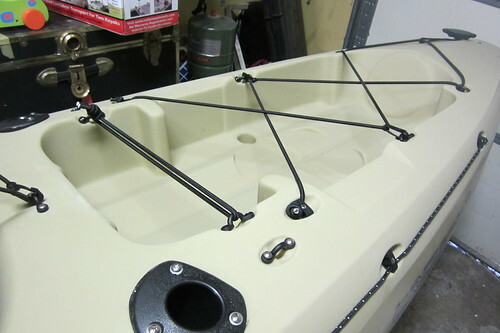 I plan on a ton of posts involving the use or customization of this boat, so stay tuned!